Soaring high above The Keep, you look down at the full grown Celestial Puvia you are riding. Glossy feathers in every shade of color are flattened beneath the wind, and the sun beating down transforms this creature into a living rainbow. Strong as it is beautiful, this adult often leaves for days, hunting and gathering material for its ever-growing nest. You love to give this bird soft scraps of fabric, watching it tuck it away in its nest. You look forward to the day when more brightly colored eggs show up for you to tend to, and your Puvia becomes a parent. With feathers colored like a rainbow, this bird is beautiful and highly treasured. Adventurers will travel farther than normal in hopes of retrieving a bright Puvia egg. Majestic in flight and extraordinarily large, Celestial Puvias are valuable companions. 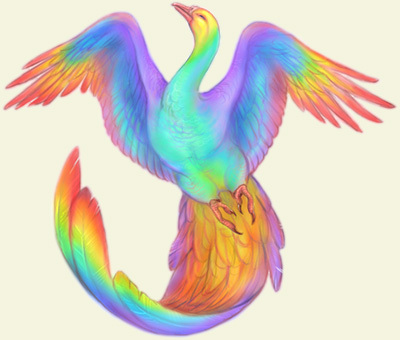 A master is to be warned, however, that it is best to fly a Celestial bird only in friendly territory or at night, as these multi-colored creatures do not camouflage well. Originally from the jungle, these birds hid among bright flowers to evade any large predators, but in The Keep they can only stand out with their beautiful plumage.